Hearing aids and the technology within has progressed exponentially over the last few decades. Hearing aid styles range from the almost invisible Completely-In-Canal to the conventional Over-The-Ear hearing aid style. The available options can be overwhelming. The best type and style of hearing aid for you will depend on your hearing loss and lifestyle. The advent of digital technology has impacted the look, feel and functionality of hearing aids. Modern hearing aids can be invisible to the eye and sound so natural that they mimic the way you heard before your hearing loss. Digital hearing aids account for almost all hearing aid sales in the developed world today. When the sound settings are right, the quality of the sound reproduction and correction can be amazing. Multiple microphones allow for better hearing in noisy environments. Open fit designs allow for ear canals to remain unobstructed which helps eliminate occlusion (that plugged up feeling). Feedback cancellation algorithms eliminate whistling before you hear it. Automatically adjusts to your sound environment, whether you are in a crowd, car, or quiet. Digital hearing aid sound settings can be precisely programmed by a competent hearing professional with a computer to meet your specific hearing needs. Bluetooth or other wireless technologies allows for you to hear your cell phone, television and other devices directly through your hearing aids! Digital hearing aids process soft, normal and loud sound completely different from each other. Some digital hearing aids include the capability to reduce environmental noise such as electric motors, fans, etc. Each technology level offers a digital hearing solution based on your hearing loss, lifestyle and budget. Conventional hearing aids generally use simpler analog amplifiers that feature manual volume controls and trim pot fine-tuning. 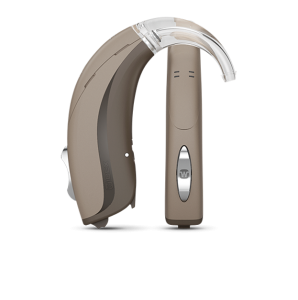 This type hearing aid is most beneficial for hearing in relatively quiet environments such as one-on-one conversation. Behind-The-Ear (BTE) hearing aids sit behind or on top of the outer ear with a tubing that routes the sound down into the ear canal via a custom earmold or tip. BTE hearing aid styles are available in different colors to match hair or skin tone. 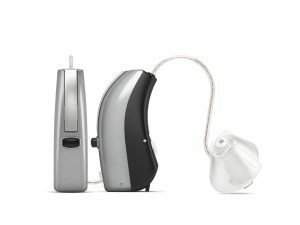 In-The-Ear (ITE) styles – These hearing aids are worn in the ear and are usually custom molded, based on an impression taken by a hearing care professional at the time of the hearing aid consultation. These styles are typically available in different skin tones to blend with the outer ear. This type of hearing aid is extremely versatile. RIC hearing aid styles are BTEs that have the speaker built into the ear tip instead of the main body of the hearing aid. The hearing aid speaker rests in the ear canal but the microphone and processor sit in a tiny case behind the ear. They are connected by a thin wire. The ear tip is larger to accommodate the speaker but if it malfunctions due to wax or moisture damage, it can often be replaced at the hearing aid center instead of going to the manufacturer for repair.